The turbocharged 1.5L ECOTEC® engine employs fuel-saving technologies including Variable Valve Timing, Direct Injection and stop/start technology. It powers a sporty, responsive ride that offers an impressive 36 MPG highway and a maximum highway range of up to 560 miles per tank. The new RS brings a new level of style to the Malibu lineup. The exterior features an exposed dual exhaust design, a rear spoiler, unique 18-inch machined wheels, Black sport grille and bowtie emblems, and RS badging. Inside, you'll find a leather-wrapped shifter and steering wheel, and a power driver seat. 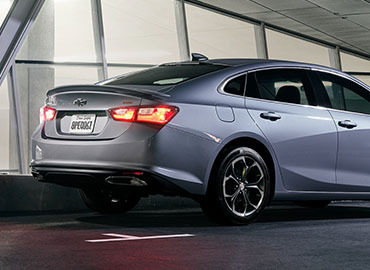 The newly redesigned front fascia of the Malibu demands attention as soon as you face it. Android Auto™ support allows you to use select features of your compatible Android™ phone via your Chevrolet Infotainment System display. Standard on most Chevrolet models, you can access your phone, texts, music, navigation and send and receive messages while keeping your hands on the wheel. You’ll also enjoy voice-guided navigation, live traffic information, lane guidance and more with Google Maps™. Inside, you’ll find a spacious, comfortable and quiet interior with refined touches like available steering wheel-mounted controls that put ingenious technology at your fingertips. With available Rear Cross Traffic Alert, radar sensors detect other vehicles approaching from either direction and utilize the rear vision camera to visually warn you of those vehicles, like when you're backing out of your driveway or parking space.